What is the Silver State Classic Challenge, Inc.? Silver State Classic Challenge, Inc. is a non-profit corporation with a dedicated volunteer Board of Directors and staff who annually host the Nevada Open Road Challenge (NORC) and the Silver State Classic Challenge (SSCC) Open Road Racing events on Nevada State Highway 318, renamed by the Nevada Department of Transportation the Silver State Classic Challenge Highway. What types of racing events does SSCC host? SSCC offers two different Open Road Racing event formats. 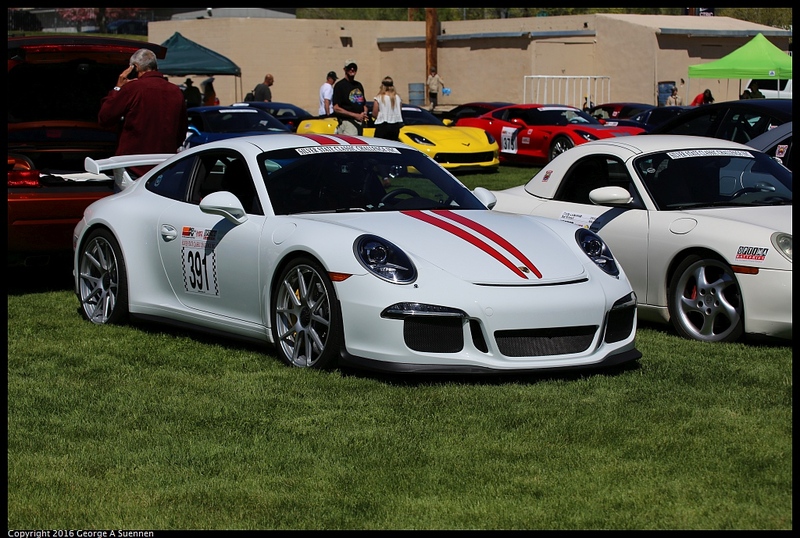 The NORC, held every third Sunday in May, is a two-way event, totaling 119.78 miles (59.89 each way), with the NORC Awards Banquet held in Ely, Nevada. 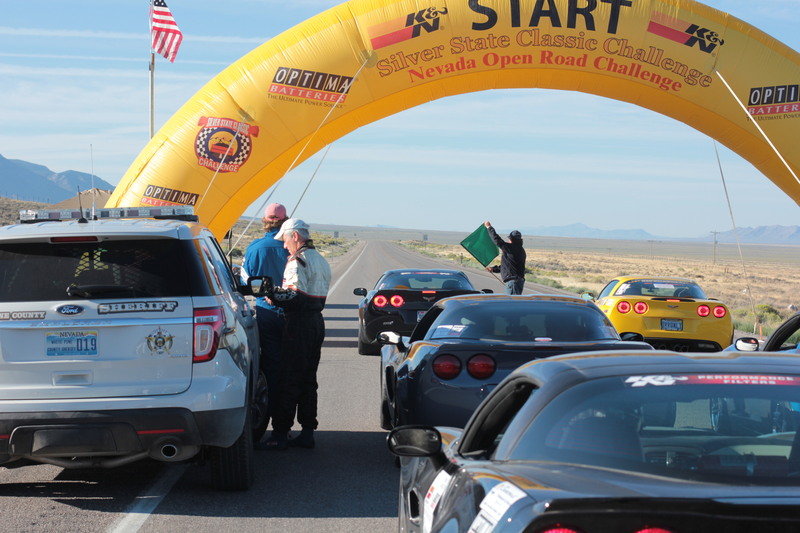 The SSCC, held every third Sunday in September, is our classic 90-mile, one-way event, with the SSCC Awards Banquet held in Las Vegas, Nevada. SSCC also hosts companion One-Mile and Half-Mile Shootout events on both race weekends. Open Road Racing events are competitive driving events measured by time, speed, and distance. Vehicles begin from a standstill, starting one at a time against a GPS time clock at the top of each minute (or in some cases, thirty seconds) apart, and drive a prescribed distance based on specific time targets and speed class averages. Whoever breaks the timing beam at the end of the course with the most accurate target time variance in each speed class is the winner. At SSCC, speed classes begin at 95 mph, and increase in 5 mph increments up through the 160 mph class, plus a 170, 180, and Unlimited class (only in the SSCC event for 2018). First, Second and Third place trophies are awarded to the Driver and Navigator/Co-driver in each class. Trophies are also awarded to drivers of our companion One-Mile and Half-Mile Shootout events, where whoever runs the fastest speed in three attempts is the winner. Who can enter an SSCC event? SSCC events are open to anyone 18 years of age or over with a valid driver’s license, a vehicle and safety gear that can pass our technical inspection process. What type of vehicles may compete in SSCC events? Just about any type of closed-fender vehicle with four wheels or more may enter an SSCC event. We have hosted everything from Ferraris to Pickups, Panteras to Saturns, and Tesla EVs to a Prius. We’ve even had vintage big rigs, and scores of former NASCAR competition vehicles. Just about every production marque ever made has shown up to race down Highway 318. Are Motorcycles, Can-Ams, or Slingshots allowed to race? Unfortunately, no two or three-wheeled vehicles of any kind are allowed to enter an SSCC event. No. 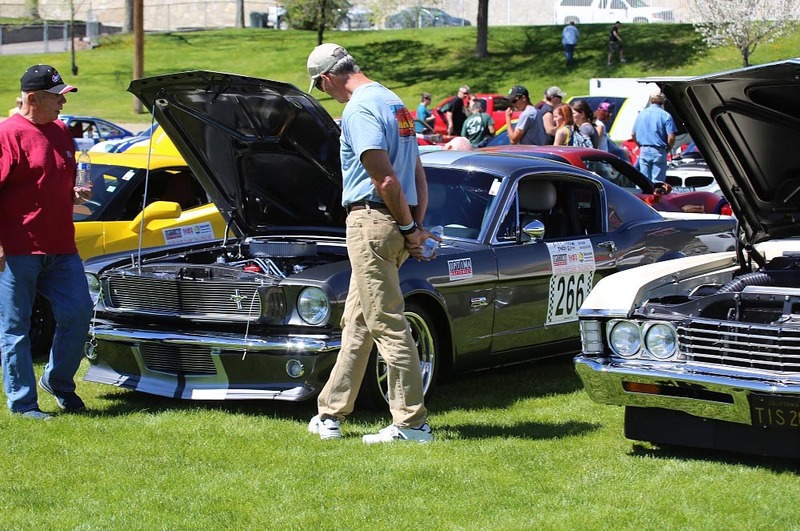 Many first-time SSCC event participants have no prior competitive driving experience. What is the cost to enter an SSCC event? 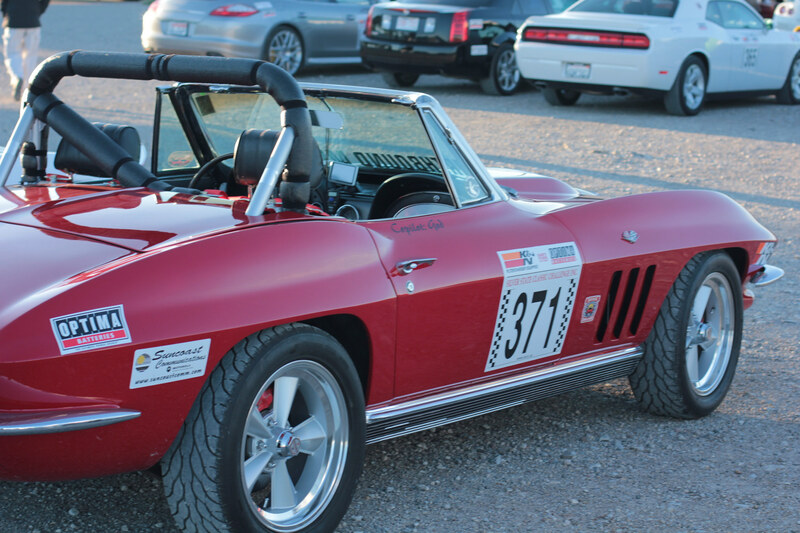 Please view our Entry Fees page for our Open Road Racing and Shootout events fee schedule. Do SSCC events allow spectators? Unfortunately, there are no spectator areas to view our events. You may, however, obtain a front row seat for our events by volunteering to be a course worker. Course workers are required to secure gates along Highway 318. 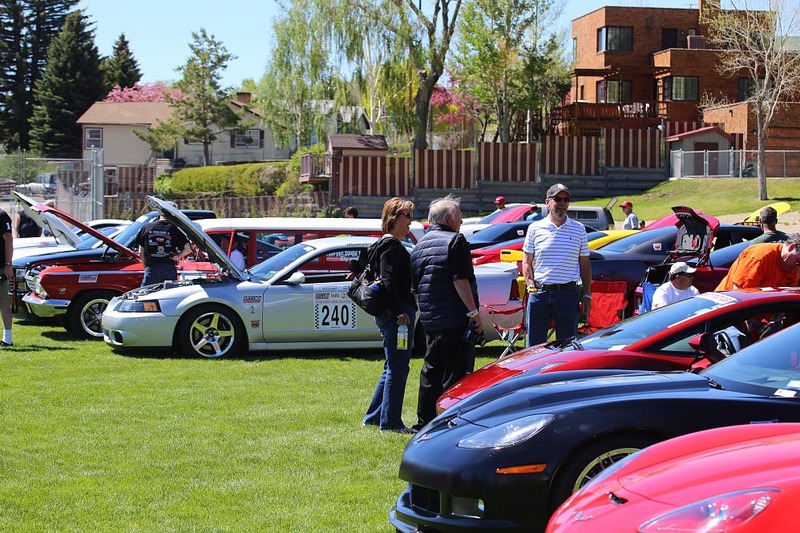 Course workers are also invited to participate in all event activities, including the SSCC Press Luncheon in Las Vegas, the Caravan from Las Vegas to Ely, the Parade of Cars, The Welcome Reception, Car Show, Awards Banquet, and any other events. However, there is a minimal cover charge for the Awards Banquet. Please view our Course Workers page to volunteer. Where can I see all of the race cars? Many of the event cars are gathered on Thursday morning of SSCC weekend in September in the parking lot of Sam’s Town Casino Hotel in Las Vegas. 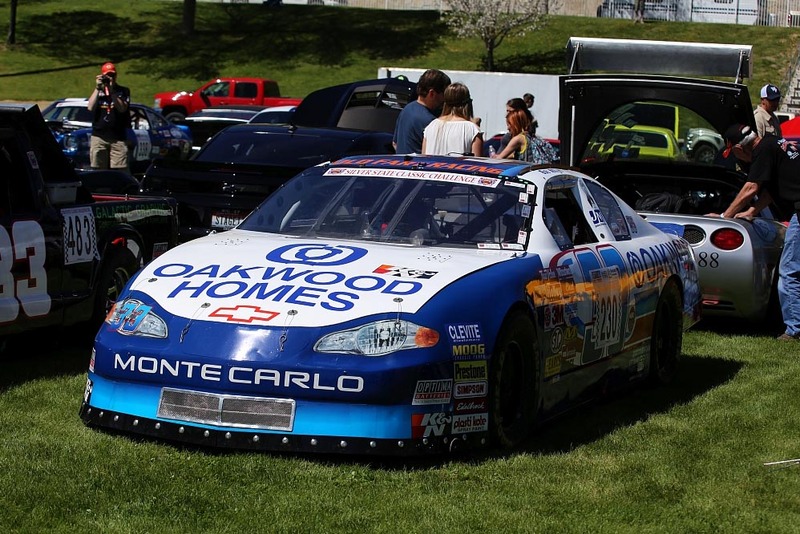 You may see the entire field of cars in the Parade of Cars on Friday in Ely, and again on Saturday morning at Broadbent Park for the mandatory Car Show in Ely. Are there any special requirements for first-time participants? First-time SSCC event participants are required to attend a high performance driving school at SPEDVEGAS in Las Vegas on Thursday morning before the NORC and SSCC events. Please view our NORC and SSCC Rookies pages for details. What speed class or division do you recommend for first-time entrants? SSCC rules require first-timers to enter the Touring Division, which allows target speed classes ranging from 95 mph up to 110 mph. The Touring Division allows for a maximum tech speed of up to 124 mph, which is fast for your first time on an unfamiliar road. The important thing is to pick a speed class in which you and your car are comfortable maintaining consistently for 90-120 miles of two-lane road, around blind corners and dips in the terrain. Of course, for those with documented prior Open Road Racing or other equivalent racing experience, or who possess valid racing licenses from certain sanctioning bodies, waivers to enter higher speed class divisions may be granted. Such a waiver can be requested by writing to the SSCC Event Director, with appropriate supporting documentation, at least 30 days prior to the event. The decision of the SSCC Event Director is final. Where can I view a video of the course? Event course videos are available for viewing on our site by clicking here, and are also provided to all first-time entrants on DVD as part of your confirmation package. Also, you may search YouTube for Silver State Classic Challenge or Nevada Open Road Challenge to view individual competitor on-board video clips. How soon should I make room reservations in Ely or Las Vegas? Ely is a beautiful, authentic Western mining town. Hotel space is somewhat limited, and rooms fill up quickly on both SSCC event weekends. Please view our Hotel List for your best options. What is the SSCC event Technical Inspection process, and how do I pass? It is the responsibility of every SSCC event participant to read the rule book, cover to cover, and comply with the rules therein. When in doubt, read the rule book. Please view our SSCC Event Rule Book. Are there any special requirements for tires? Yes. All vehicle tires must be within certain age ranges based on tire manufacture date codes, and have good tread with no unusual or excessive wear patterns. Tires must meet all age range, speed ratings, and meet or exceed load requirements for your vehicle based on OEM specifications, and also meet all requirements for your division and speed class. Please read the SSCC Rule Book carefully. Tires are the number one reason people fail SSCC technical inspections. If you're unsure about your tires meeting our requirements, or have any tire-related questions, please contact our SSCC Chief of Tire Tech listed on our Event Operations page. What is the difference between my car number and my grid position number? Your car number is the number we issue you to place on the sides of your vehicle, and is used to identify your vehicle for timing and scoring purposes. Your grid number will be issued to you at the event Drivers Meeting, and represents your place on the grid in the official starting order for the event. It is the number order we will use to send you to the starting grid from the pre-grid at Lane's Truck Stop the morning of the event. This will be explained at the event Drivers Meeting. What is the difference between Division and Speed Class? A Division is defined as a grouping of Speed Classes. Speed Classes are individual classes with a set Target Speed. For example, the Touring Division has Speed Classes ranging from 95 to 110 mph. The Grand Touring Division has Speed Classes ranging from 115 to 125 mph. Grand Sport Division has Speed Classes ranging from 130 to 155 mph. Super Sport Division has Speed Classes ranging from 160 to 180 mph. Unlimited Division, or Unlimited Class, is the only Speed Class where competitors may drive the event course as fast as they can possibly go, with no Tech Speed limit, in pursuit of setting a new Guinness World Record elapsed time and speed average. What is the difference between Target Speed and Tech Speed? Target Speed, often referred to as your Speed Class (or class speed), is the speed which you are trying to average over the distance of the course. It is mathematically best represented as your Target Time. Your Target Speed is not to be confused with your Tech Speed. Your Tech Speed (or Technical Speed) represents the maximum speed you are permitted to drive at any point on the course. Your maximum Tech Speed is determined by what Division and Speed Class you have entered, your level of safety equipment, and your level of experience. Touring Division has a maximum Tech Speed of 124 mph. Grand Touring Division has a maximum Tech Speed of 140. Grand Sport Division has a maximum Tech Speed of 165 mph. Super Sport Division has a maximum Tech Speed of 180 mph. Unlimited Division had no maximum Tech Speed. You also have a minimum Tech Speed. With the exception of slowing down for curves, or when a caution flag is displayed, all vehicles must maintain their minimum Tech Speed on the course. In all Touring Division classes, the minimum Tech Speed is 80 mph. In all Grand Touring, Grand Sport, and Super Sport Division classes, you must maintain a speed no less than 30 mph under your Target Speed. In Unlimited Division, the minimum Tech Speed is 150 mph. What happens if I exceed my Tech Speed? Do not break your Tech Speed. Tech Speeds are strictly enforced at SSCC events. Radar guns are placed randomly throughout the event course. Anyone caught exceeding their Tech Speed by even .01 mph will be Disqualified (DQ’d) and not be scored. If you receive a DQ, you will be considered a Rookie at your next SSCC event, and will have to attend Rookie School once again. If you blatantly disregard your Tech Speed, or exceed your Target Speed at the Finish Line by more than a 10 mph average, you will be DQ’d, made an example of, potentially banned from all Open Road Racing events for a period of 5 years, or possibly even for life. Tech Speeds are for your safety, and for the safety of others in your Speed Class. We want you to have fun, but not at the expense of others. There is one simple rule on this topic. Do not break your Tech Speed. What happens if I drop below my minimum Tech Speed? With the exception of slowing down for curves, or when a caution flag is displayed, all vehicles must maintain their minimum Tech Speed on the course. Anyone caught driving below their minimum Tech Speed outside of a curve, or when no caution flags are displayed, will be Disqualified (DQ’d) and not be scored. If you receive a DQ, you will be considered a Rookie at your next SSCC event, and will have to attend Rookie School once again. What if I break down during the race? Can I repair my vehicle and continue? No. The vehicles behind you are likely traveling at their Target Speed, or in some areas of the course, closer to their Tech Speed. The danger created by a slow vehicle reentering the road in front of other competitors travelling at those speeds is too dangerous to allow. Once you pull off the road, your day is done until the event is over. In some good news, Course Workers often have shade, cold beverages and snacks. Plus, you’ll get to be a spectator for the rest of the race. Do you recommend a scanner for our car? You will be issued a radio for emergency communications during a red flag event on the course. However, if you have a scanner, you will be able to listen to race control communications, and could be made aware of changing road conditions, debris, rain, wind, or even a red flag situation much sooner than otherwise. A scanner comes in handy on the grid, or during a red flag, for knowing what is going on. Race control frequencies will be read aloud at the Drivers Meeting. If I do not pass Tech Inspection in Las Vegas on Thursday (SSCC) or in Ely (NORC & SSCC) on Friday, are there parts, race gear, or tires available in Ely? There are parts stores and tire shops in Ely, and they are always ready to help our participants out, but chances are, the closest high-performance parts, tires, or safety gear for your vehicle will likely be 240 miles away in Las Vegas. Bringing along a few common spares such as: belts, hoses, brake pads, or an extra set of mounted tires may go a long way, if only for peace of mind. What happens if I get a speeding ticket on Highway 318 within 90 days of an SSCC event? Much like not breaking your Tech Speed, you do not want to get a speeding ticket on Highway 318, especially within 90 days on either side of an SSCC event. If you do, you will receive a DQ from the event, will have to return any trophies you won, and you will be considered a rookie, having to attend Rookie School once again at your next SSCC event. This rule is part of Nevada DoT requirements for the SSCC permit to hold these events, and the Nevada Highway Patrol, or Sherriff’s offices of White Pine, Lincoln, and Nye counties will notify SSCC event officials of your citation. Please remember, we are guests in the area, so save the speed for race day. Should I have snacks, water, sunscreen, or a hat in my race vehicle? Yes. Highway 318 is a remote desert road. If there is a red flag, or other delay, or if you break down, you will get hungry, thirsty, and possibly sunburned if you’re outside. You may have bottles of water, snacks, sunscreen, or hats in your vehicle, if you can secure them in a separate, closed trunk, or can tie or tape them down inside of the cockpit. No loose items will be allowed.